Is Your Email Bouncing Back? Post in "Tiger Talk Forums"
Kenneth E Smiley Jr., of Barrington, Illinois, formerly of Rancho Palos Verdes, California, passed away on February 3, 2018. He was born on July 22, 1929 in Los Angeles to Dr Kenneth and Katharine West Smiley (SPHS '15). 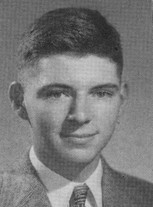 Ken grew up in South Pasadena and San Marino and graduated from South Pasadena-San Marino High School in 1947. He attended Occidental College where he graduated with a degree in economics in 1951. After that he attended Stanford Business School and earned his MBA in 1953. He was a veteran of the United States Navy, where he was stationed in Guam. Ken will be deeply missed by his loving wife, Bonnie Laws Smiley (SPHS '49); his children, Jill (Stuart) Asbjornsen of South Pasadena, Kenneth (Darlene) Smiley III of Long Beach; grandchildren Ian Asbjornsen (SPHS '04), Anders Asbjornsen, Kenneth Smiley IV and Kelly Smiley; Bonnie's children, grandchildren, and great-grandchildren; his sister, Mary Jo (Phil) Gumbert; and by many nieces and nephews. He was preceded in death by his first wife, Marilyn Avery; his sister, Sue Hamlin (SPHS '44), his brother Douglas Smiley; and by his parents. Ken was not my classmate, he being three years older, but my husband of the past five years. It took us a long time to get together and our time was short but full of love and laughter. He will be missed by all who knew him through the years. He brought SMILES to us all.